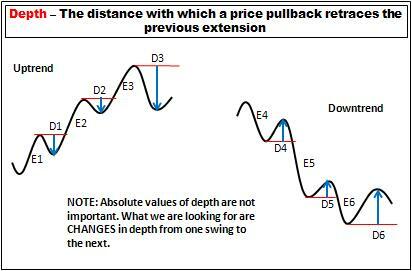 Depth refers to the distance with which a pullback retraces the previous extension. Looking at the uptrend in above diagram, we see three extensions E1, E2 and E3. Depth D1 is the distance with which the pullback retraces E1 (think in percentage terms, rather than price values). D2 is the depth with which the pullback retraces E2. And D3 is the depth with which the pullback retraces extension E3. As with projection, we are not greatly interested in the absolute values of depth; rather we note significant changes of depth from one price swing to another. Note that D2 is a much smaller percentage of its extension E2 (approx 20%), when compared to D1 (approx 40%). D2 has smaller depth than D1, indicating a potential weakening of the bears, and therefore strength within the price trend. Note that D3 is significantly larger than D2, indicating potential strength within the bears, and therefore potential weakness within the price trend. The same concept applies to the downtrend. D5 is showing greatly reduce depth when compared with D4 (remember we compare D5 as a percentage of E5 (approx 20%) with D4 as a percentage of E4 (approx 60%)). Reduced pullback depth in a downtrend is a sign of potential weakness in the bulls, and therefore potential strength in the downtrend. D6 is showing a much greater percentage depth than D5, indicating potential strength in the bulls and therefore potential weakness in the trend. Increased depth is a sign of potential trend weakness. Decreased depth is a sign of potential trend strength.